John is a child convict, transported to New South Wales for stealing a shirt. Life is grim in the fledgling colony and when food runs short, John once again has to steal to survive. Starving and alone, he is taken in by Australia’s first schoolteacher, Isabella Rosson. In her simple classroom, John learns to read and write and soon becomes her star pupil – until he is discovered by the soldiers and again sent away in chains. Yet John never forgets Isabella’s lessons, the power of words – and the hope for a brighter future. 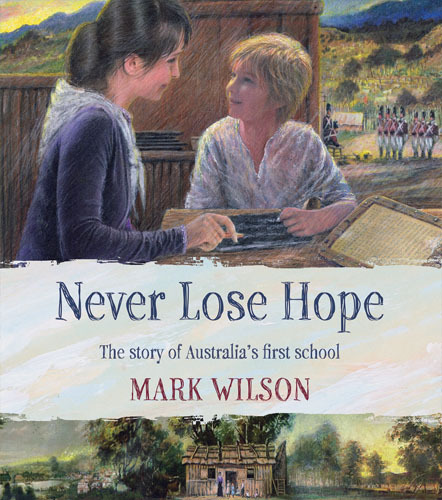 Inspired by the life of convict Isabella Rosson, the first teacher in the colony at Port Jackson, and John Hudson, the youngest First Fleet convict, this touching story is illustrated with Mark Wilson’s vividly realistic and evocative artwork.